I recently observed a weird problem in the right click menu in XP, the moment I right click on my desktop it takes like lot of time to open the menu. I was trying to figure out what the problem was. After sometime I figured out that it was some item in the menu that was resulting in delay in displaying the menu. I downloaded ShellExView and opened it and arranged all the items according to Type. I found a list of various items relating to type- Context menu, I tried disabling each of them to see which one was creating the problem. I finally realized that it was the ATI software which appeared in the menu that slowed down the menu. As soon I disabled the ATI software option in the menu the menu popped up really fast. Firstly, download ShellExView and run it. 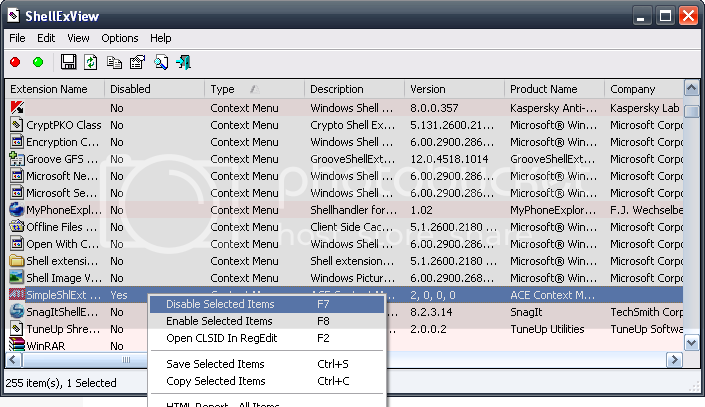 Now find the items relating to Context menu and disable one and check the menu if it’s fast, if it isn’t enable back the item and try disabling another one. To disable/ enable an item simply right click on it and select the option Disable Selected Items/ Enable Selected items. Once you feel you have fixed the problem and the menu is appearing faster then simply close the program. NOTE: The disabled item will not appear in right click menu, to display it again you need to repeat the above and select enable item.